Product #21433 | SKU 8510 | 0.0 (no ratings yet) Thanks for your rating! The MOTU 8pre 16x12 USB Audio Interface with 8 Mic Inputs is designed for studio recording with a digital audio workstation. The audio interface features eight microphone/instrument preamplifiers with switchable +48V phantom power, front panel trim knobs, and a 20 dB pad. 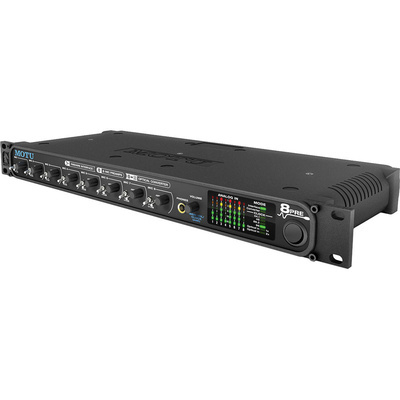 For I/O the device also includes eight channels of ADAT optical expansion inputs for connecting to an existing interface, eight channels of ADAT optical expansion outputs, a stereo pair of balanced or unbalanced TRS outputs, and a stereo headphone output. For recording and playback, the interface's audio engine is capable of up to 24-bit 96 kHz resolution recorded over USB 2.0.